Applying to college is a very rough process and without the right kind of help, students really have an uphill battle pulling together their applications. That’s exactly why I got into working on college admissions essays. My two sons graduated from a high school in a small town in upstate New York. The school certainly had its fair share of talented and dedicated students and teachers, but when it came time to apply to college, I got the sense that the counseling folks and the English teachers really didn’t know much about how to write a college admissions essay. Neither did I at the beginning, but, being a writer, I figured it out and ultimately began working with more kids in the community, with the children of friends and friends of friends, and then with an ever-growing roster of clients, all around the world. 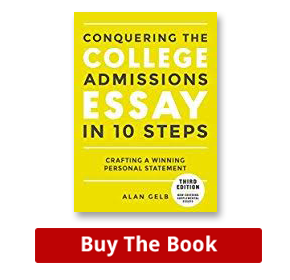 I gathered my theories in my book, Conquering the College Admissions Essay in 10 Steps, and people have valued its simplicity and clear thinking about a complicated topic. Now, whenever I work with students and their parents, I hear a lot about how difficult it is to grab the attention of their guidance counselors. Naturally, these counselors are overworked and underpaid. The big secret, however, is that I hear the same thing when I work with students from some of the most exclusive preparatory schools in the country where the tuition is 40K and up. There too it’s a struggle to grab the counselors’ attention. That’s why people come to me, because they know that I will give them my total attention and my expertise, and I like to level the playing field just a bit by taking on some pro bono clients every year. Please excuse the long absence, but I’ve been up to my neck with student essays. Fortunately, I have been motivated in the end run by great news on the early acceptances. So far, I have students admitted, one each, to Harvard, Brown, Pomona, Cornell, and two to University of Pennsylvania. Not too shabby. I’m sure more good news awaits those in the regular pool, and wherever they land, they will do well, as this was a fine group of students. I salute their fortitude and forbearance getting through this process…and mine! Happy holidays to all and the best for the new year. 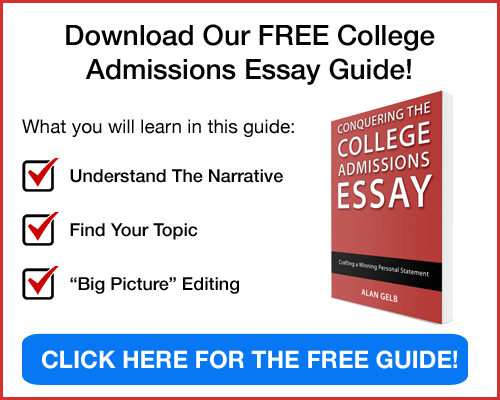 One reason why my book Conquering the College Admissions Essay in 10 Steps has been so successful is because it helps people understand what a narrative is and how you, as a writer, can effectively convey your narrative (i.e. story). A lot of people are under the impression, however, that the story has to be a Big Story. Well, in fact, people who have unfortunately led very conflict-ridden lives–political refugees; those who have dealt with serious illnesses; homeless people; those who have a parent who has deserted the family, let’s say–have a very Big Story to tell. Of course, their challenge is to find a manageable way into a story that might be so big that it could overwhelm the 650-word allotment that the Common App allows. On the flip side, we have all those people who have grown up in affluent, comfortable suburban America who may not have a conflict-ridden Big Story, but that doesn’t mean that they don’t have a story that will work really well for them. A lot of my students who fall into that latter camp write about activities that they are passionate about–dancing, baking, swimming, archery, crew, running, singing, what have you–and they depict themselves in that activity, with reflective material sandwiched in amid the “action” of the piece. This allows the reader to stick with you because he/she can see that something is “happening,” (balls are pitched or yeast is added or arrows are shot) and that gives the reader the patience to stay with the reflective content when it appears. That reader may also be interested in the activity depicted, so that’s an added bonus for him/her. What I have come to realize, however, is that some of the most “active” pieces my students turn out are those that depict really interesting thinking. A student running through the woods but thinking about biodiversity. A student baking cookies and considering how food can serve as a kind of connective tissue between generations. A student biking up a hill and thinking about the mind’s ability to prevail over the limitations of the body. Reading the thoughts of a bright and inquisitive mind can be exhilarating for a reader. So don’t feel you need a Big Story. Just tell one that conveys your energy and spirit and you’ll be halfway home. The brilliant American writer Cynthia Ozick once said, “If we had to say what writing is, we would have to define it essentially as an act of courage.” Fear and writing go hand in hand, and the writing process is largely about suppressing the fear (you can never make it go away altogether). Acknowledge your fear head-on, rather than trying to escape it by playing Candy Crush or whatever. Confronting your enemy is a powerful thing. Focus not on failure, but on the work itself. Writing is really about an accumulation of words, sentences, paragraphs, pages, drafts. If we allow ourselves to go through the paces and concentrate on the process, we can put fear into the corner and make real progress. Perfection is an unattainable goal when it comes to writing. It’s unattainable for the greatest writers, even if their work may seem perfect to us, because there will always be little things that a writer will see that he or she wishes had been changed. So let’s focus on finished pieces, rather than perfect pieces. That means that there comes a time when it’s okay to say that the work is finished–so long as the work is as good as you can make it. Of course, when Cynthia Ozick was talking about writing as an act of courage, she wasn’t just talking about suppressing the fear of writing. She was also talking about the courage that is involved when we confront personal issues and try to give meaning to them through writing. That is a big part of why students often struggle with the Common App personal statement–because this is writing that has to do with your internal life and it takes courages to put your internal life out there for everyone to see (or read). That act can also be exhilarating, however. I see that with my students–the pride they take in achieving real expression around personal matters. That excites me as well and, most importantly, it excites the admissions committees at the colleges. I’m happy to share with you my good news. Soon I will not only be working with high school students and aspiring graduate students on their essays, but also with folks on the other end of the lifeline. I have just sold a new book to Tarcher Penguin entitled Having the Last Say: Capturing Your Legacy in One Small Story. 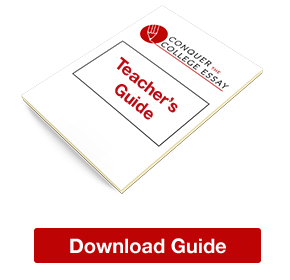 This book is, to a large extent, based on the work I’ve done with students–that is, it uses the same kind of exploratory process and the same kind of attention to the narrative form–but those doing the life review have a lot more life to review. The idea is to reflect on your values and beliefs, write a 650- to 1,000-word narrative to convey a value or belief in a highly readable way, and thereby create a keepsake for your loved ones or even a piece of writing that could be read at a person’s own memorial service. Tarcher Penguin, which specializes in mind, body, spirit titles like The Artist’s Way and Drawing on the Right Side of the Brain is the perfect house for this, and they will be bringing it out in the summer of 2015. For me, one of the most satisfying aspects of my work is seeing students begin to appreciate the editing process. There is so much pleasure to be had in making one’s work better. Truman Capote, author of the classic In Cold Blood and Breakfast at Tiffany’s, once said, “I’m all for the scissors. I believe more in the scissors than I do in the pencil.” (If you’re wondering what scissors have to do with writing, writers used to literally cut and paste text, before Word came along with virtual “cut-and-paste”). Writing, in fact, is mostly about rewriting. Another great writer, the French novelist and Nobel Laureate Anatole France, said, “You become a good writer just as you become a good joiner: by planing down your sentences.” That act of planing is what makes writing feel not just like an art but also like a craft that one can excel at, when discipline is applied. When my student writers write their first drafts, I always caution them that they mustn’t get hung up on making these drafts great or even especially good. It’s better to just get something down, send it on, let the collaboration of writer and editor begin, and grow the piece that way. The best thing for me is when I see a student care as much about his or her piece as I do. And that’s something that I see not that infrequently, I’m pleased to say.